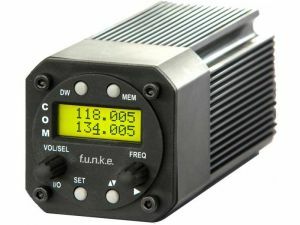 The ATR833S replaces the well-known ATR500 radio. It complies with the new channel separation of 8.33 kHz. The ATR833S is a completely new development with state-of-the-art digital signal processing. The extremely lightweight plastic housing reduces the weight to below 400 grams and makes it one of the lightest radios in its class. The ATR833S has like the well-known ATR833 a built-in voice controlled intercom. New is the automatic recognition of the microphone type. The simple and intuitive operation The bright two-line LCD display of the ATR500 was deliberately chosen, as it is easy to read with just a few additional icons providing all essential information. For the radio, a large number of cable adapters are available, so that in most cases an easy replacement of the device is possible. will appeal to pilots, who appreciate the essence of easy operation and makes it particularly interesting for clubs and aircraft owner communities.